The Bordelais, humble lands and divine wines. The Bordeaux region as a whole today represents over 12,000 hectares of vineyards and ten grape varieties. A region that offers some of the most prestigious appellations in the world, listed under the generic “wines of Bordeaux” label: Margaux, Pessac Léognan, Sauternes, Saint-Émilion or Pomerol, to name just a few. A region enriched by thousands of châteaux and estates that leave one dreaming: Cheval Blanc, Latour, Yquem, Margaux, Mouton Rothschild or Pétrus, mythical names that evoke divine nectars! Left bank – Right bank. The Garonne River, which runs into the Gironde’s estuary provides the backbone to the line of vineyards that abound along the riverbanks. Like a rosary, with precious red and white grains, whose principal grapes are the cabernet sauvignon and the merlot for reds and sauvignon for whites. The Medoc vineyards on the left bank run as far as the mouth of the River at the Pointe de Grave, offering the finest wines on otherwise dull soil. Further south, you’ll reach the Pessac Léognan and Graves appellations on soils that bring out the best of the semillion and sauvignon grapes to reach the apotheosis, the sweetness of the Sauternes, wines like honey and amber made from grapes that are only picked when ripe. The sharing of the waters. The Entre-Deux-Mers is located between the Garonne and the Dordogne and between two Rivers, thus given its name to an AOC. The Premières Côtes de Bordeaux appears on the side of the River offering the Garonne a bed of vines. Travelling up the right bank towards the clay soils of the Libournais region, one reaches the very top, ample and full bodied reds that are the Pomerol and the supple and profound elegance of the Saint-Emilion, jewels of the Bordeaux region. Returning to the Estuary. 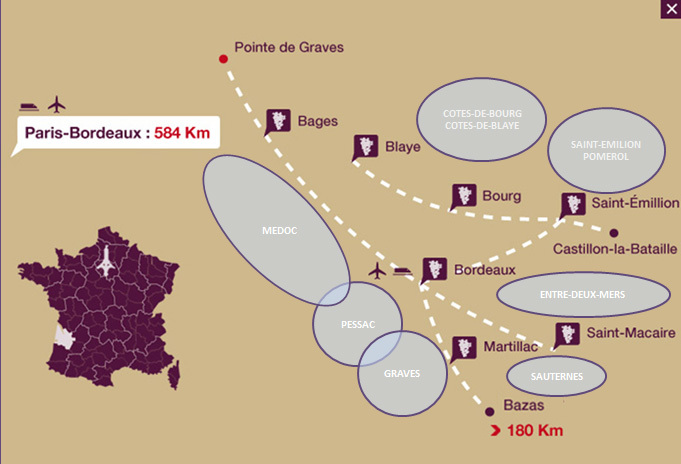 The circle of Bordeaux wines completes itself with the Côtes de Bourg and Côtes de Blaye. Reds dominate. Wines that are dark and profound, tannic with marked character and great tipicity. After that, you just need to take the ferry to go back to the left bank and the land of the Pauillac and Saint Julien. The Bordeaux region is a mosaic of soils and land that make for wonderful wines to drink, each with its own story to tell. Bordeaux in abundance. The Latin poet Magnus Ausone, was born in Bordeaux in the IVth century, and praised his vine by signing “O my land famous for its vines”. The Antique Burdigala created by the Romans in the IIIrd century B.C. was already a famous emporium. A port for the trade of goods, mainly with Ireland, England and Flanders. The taste for French wine enabled Bordeaux, in the Middle-Ages, to establish itself as wine capital of the Western world. In the XIIth century, Aliénor of Aquitaine, wife of Henri of Anjou, dit Plantagenêt King of England, gave Bordeaux its wealth by developing the Gallo-roman vineyard. The best way to discover the region is to stay in Wine Chateaux that are now open to happy few thanks to WineTravelinFrance, the agency specialised in high end Wine & Gastrnomy tours in Bordeaux areas. Some « happy few », from the Latin poet Ausone to the actress Audrey Tautou. The Latin poet Ausone who celebrated the vine and wine of Bordeaux with great joy lived in Bordeaux in the year IV of our era. He owned villas near Saint-Emilion and found inspiration in the divine nectar. The Emperor Charlemagne stayed at the Château des Francs. A fortress overlooking the Garonne near Fronsac that offered a strategic position. A number of watch towers, some of which remain, where erected under his command in the region, It is in Blaye, in the old crypt, that Roland was laid to rest, he who was Charlemagne’s loyal companion. In the XIVth century, the Pope Clément V was none else than the owner of the wines and château neamed after him in Pessac. The son of the Black Prince, Charles Ist, futur king of England, was born in Bordeaux in 1637. It is in the Chapel of the château of Pessac near Castillon-la-Bataille that the peace treaty that ended the Hundred Year War was signed with the English General Talbot. Richelieu, the village and vineyards were bought by the family of the Duke of Richelieu. The château Cassagne in Saint-Michel de Fronsac was then the prelate’s favourite hunting lodge. Three men of letters have left their mark on Bordeaux’ cultural life: Montesquieu, Montaigne and François Mauriac. Montaigne was mayor of Bordeaux in 1581. Montesquieu, baron de la Brède, man of letters from the XVIIth century, was born and lived in his château de la Brède. The estate has been restored and is open to the public. La Boetie, Marguerite de Carles’s husband lived at the château Haut Carles in Saillans. Jean-Jacques Rousseau, Beaumarchais and Diderot would later stay there in the XVIIIth century. The writer François Mauriac would retreat to his family estate surrounded by vines, the Malagar estate. This old residence has now been transformed into a literary estate and music academy in memory of the great author, who took inspiration from the agricultural and wine making worlds that surrounded him, for many of his novels. A neighbour of Malagar, the château de Malromé, a wine making estate today, used to belong to Adèle de Toulouse-Lautrec, mother of the famous painter Henri de Toulouse-Lautrec. Henri enjoyed his last days at the château. He was laid to rest in the small cemetry in Verdelais, nearby. In 1824, the Spanish painter Francisco Goya settled in Bordeaux and spent the last four years of his life there. Max Linder ‘s family owned the château de Chadenne near Fronsac in the last century. The marquis Jacques Charles de Mus, a descendant of the poet Alfred de Musset owns a château and vineyard in Saint-Macaire. The Cité Frugès in Pessac, on the outskirts of Bordeaux was designed by the great architect Le Corbusier. In 1995, Alain Juppé, then Prime Minister, was elected Mayor of Bordeaux. The Saint-Estèphe wine from Haut-Marbuzet was President François Mitterrand’s favourite, he who was originally from the Charente region. The writers Jean Anouilh and Philippe Solers, the movie director René Clément, the actress Danièle Darrieux and the comic Nicolas Canteloup were all born in Bordeaux. Finally, the actress Audrey Tautou and the produceur filmed scences of «Thérèse D», adapted from François Mauriac’s novel, Thérèse Desqueroux, all over Bordeaux and the Gironde region.